Takashi Miike has never paid undue respect to the boundaries between genres, so it's fitting that he named his frenetic take on the spaghetti Western for a dish that involves throwing disparate elements in a pot and boiling off the excess. Sukiyaki Western Django takes the last third of its title from Sergio Corbucci's gritty, gory 1966 Italian oater, but it's only one of many ingredients in Miike's superheated stir-fry. The movie's plot, which involves a nameless gunfighter caught between warring gangs in a small town, is lifted straight from A Fistful Of Dollars, itself an uncredited remake of the Japanese film Yojimbo. (So much for the advice doled out to the mysterious stranger after he strolls into town: "Best not get any ideas about playing Yojimbo.") Mixing the legendary battle of Dannoura with the War Of The Roses (and throwing in a bit of Shakespeare for good measure), Miike pits the red Haike clan, led by the hot-blooded Koichi Sato, against the white Genji, whose Yusuke Iseya has the icy bearing of a vain pop star. 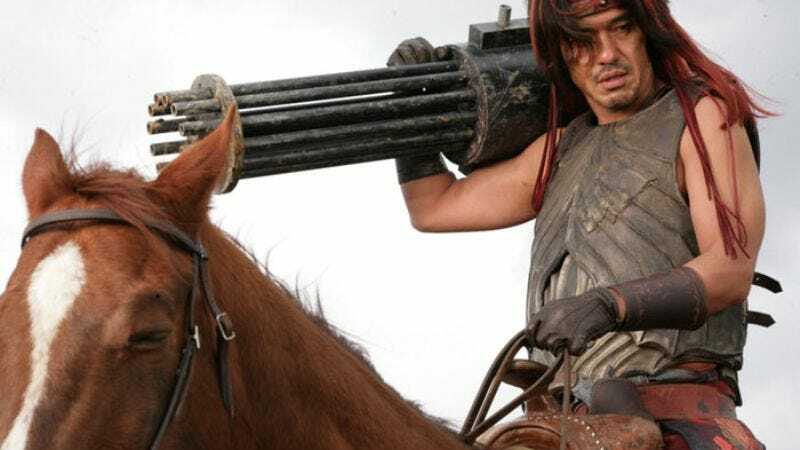 With their facial piercings and color-coordinated hair styles, the movie's hired guns would look more at home in a Baz Luhrmann movie than a Western or a samurai movie, but the clash of seemingly incompatible styles is what excites Miike the most. Although its cast is mostly Japanese, the movie's dialogue is in thickly accented, heavily colloquial English. ("Are you gonna fight, or are you gonna whistle Dixie?") English-speaking audiences will still need subtitles, but that's part of the joke. Setting up Miike's mixture of over-the-top parody and off-kilter mysticism, the movie's prologue features a cowboy-hatted Quentin Tarantino, whose voice drops abruptly from an easy drawl to a staccato bass, as if he too has learned his lines by rote. In spite of a string of nifty gunfights where bullets land with a sickening squelch, Sukiyaki Western loses some of its appeal once the novelty of Miike's conceptual shenanigans wears off. Even good jokes turn into shaggy-dog stories when they run too long.